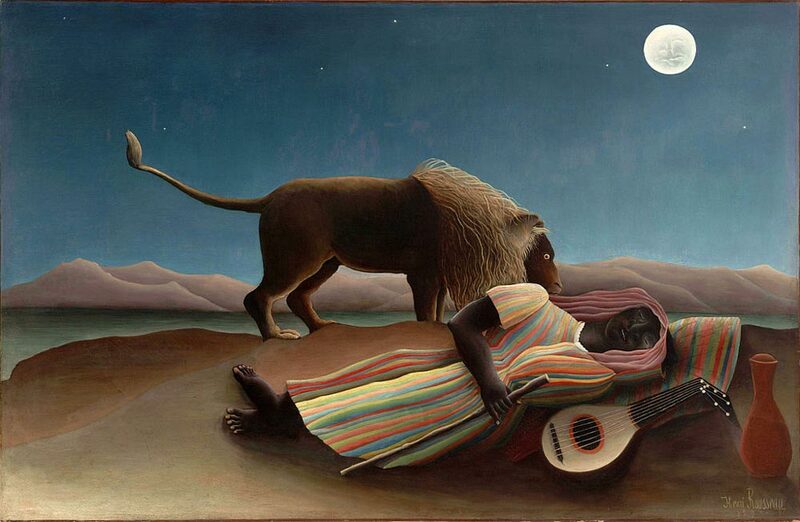 In 1897 Henri Rousseau created The Sleeping Gypsy. It has been purchased by many different buyers, but it is now housed in the Museum of Modern Art in New York. When Rousseau first created this painting he attempted to sell it to the mayor of his hometown. Unfortunately, the mayor did not pick it up so it was sold to a private collection. The Sleeping Gypsy shows a lion and a woman sleeping in a desert. The moon is out and the sky is clear, with a few stars shown throughout the darkness. In the background are a few soft mountains and flat earth. The woman sleeping is wearing a colorful dress and lying next to a vase and a guitar. The large lion is standing beside her, his head bowed down next to her head. When first looking at this piece, the eyes go to the moon, but then quickly to the woman on the ground.